Hildan Hegennerry was an ordinary kid- he had good parents, a great best friend, and a clone. Well, that part's not so ordinary, is it? Join Hildan on an action-packed adventure as he unveils dark secrets and discovers what it's like to have a brother. 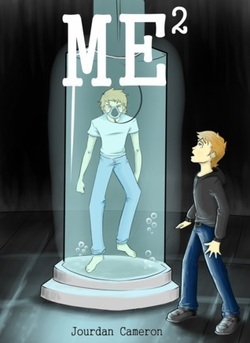 Me Squared is more than an adventure- it also tackles some very important issues regarding bioethics and human cloning- whether anybody likes it or not, the future is coming, and with it come questions without obvious answers. Me Squared dares you to begin thinking about those questions right now. When I received a copy of this book, I sat down and read it. It took me about two days to finish. Not bad! The idea of the story was brilliant. It was original, strong, and could be worked on in various different ways. Oh, how I wished that it could be a full on book! This could have easily been a book or two and I would have enjoyed reading it. My reasoning for this is because, I felt like the story was moving on at a fast-pace, and there wasn't much time in-between to savor moments that needed to be savored. With that being said, I also wished that I knew more about the characters' thoughts and feelings. To be honest, lately I feel like the books I have been reading are short and precise with everything, including the development of the character. The growth, thoughts, and feelings that absolutely need to take place are taken, but no more than that. However, this is NOT the case for this story! I loved reading about what Hildan thought and felt during various situations. My only problem is the age of Hildan. In this story, Hildan is set to be your average, middle-school boy. However, sometimes I felt like Hildan had thoughts that were more appropriate for a high schooler or older. Other times, it was evident that he was a middle schooler.